An image of St. Dominic in stained glass found at his home in Torre at his home in Caleruega, Spain. I was walking along the beach with my five-year-old son. We walked past families with young children like ours who had inevitably pressed some adult into the forced labor of giant hole digging. I confess that this is a beach tradition that inspires my love and a bit of my loathing. I love watching kids build entire worlds out of a hole in the ground. Castles and homes complete with kitchens and living rooms, but I’ll tell you big holes take time and digging for an hour or two on every beach excursion isn’t exactly the swim-up bar at an all-inclusive! This is especially when you are digging with one of those made-for-kids plastic spades (even the big kind). The Dominican tradition is deep and well built. We mark the 800th Jubilee of the Order in 2016. Beginning by mentioning the Order and not the man or even the saint on St. Dominic’s feast is fitting. The earliest Dominican sources are not a life of the saint, but a text that is based on the founding of the Order, the establishment of a community of preachers as Dominic had intended. Like Jesus, Dominic lived in the collective memory of the first Dominicans because they were so busy living the life which his example and invitation had shaped for them. Though Dominic de Guzman is one of the most revered saints of the Church, he is also, as one of his biographers, Simon Tugwell, OP puts it, “more coy, and hide[s] behind the works which live after them and the ideals which they prompted others to follow.”[i] So in this age of charismatic leadership and big personality, what is the value of a saintly example of a coy, self-effacing itinerant preacher? Image of St. Dominic with the star in his hand from the Queen of the Most Holy Rosary Chapel at the Sinsinawa Dominican Mound. Dominic praised God in relationship. Early sources point to the memory of a man who was easy to live with in community. Doing life together, as many of us know, is easier said than done. Dominic was good at community. “I never knew anyone whose service of God I liked so much. And he was more zealous for the salvation of souls than any man I ever saw,” wrote an early companion. [ii] In one of the most famous episodes recorded in the tradition, Dominic stayed up all night in an inn in Toulouse to convince the innkeeper of the truths of the Catholic faith. Dominic could pull off medieval theology on tap with grace and skill that united heart and mind. He was affable and generous and applied the structure of this new religious life more readily to himself than others. Tradition also tells us that Dominic prayed and wailed so loudly at night, keeping his sisters and brothers in the faith awake, that quiet prayer became enshrined in the constitutions for the novitiate. It was as if the stream of the Spirit flowed so openly and thoroughly in Dominic that he could not turn it off – ever – particularly vexing in those wee hours of the morning. In the light of day, Dominic told others that they should pray always because life in faith meant unceasing dependence on God. In a life of praise, contemplation becomes the central act and, in truth, it cannot be separated from action in the world. Dominic knew that to consider the life of God within us was to act powerfully for God’s presence among us in community. Dominic traversed a diverse and textured world that is often flattened out in the twenty-first century popular imagination. Far from being a challenge, this diversity became one of the primary blessings of Dominic’s life. It influenced the way that the Order grew and allowed Dominic to recognize human dignity across difference, a deep blessing of others. The Order of Preachers was a diverse, multi-national community from its founding with Dominic engaging people with different worldviews and languages thought it had some political and structural unity through Latin. Even in Dominic’s lifetime communities were founded in Florence, Milan, Brescia, Toledo, Toulouse, Paris, and Narbonne. His travels put him in contact with Muslims and Jews, heretics and those zealous for the Church. There were men and women, professed and lay that came to be integrated into the Dominican family. Dominic himself had significant contact with and helped monastic women to organize themselves into various communities. 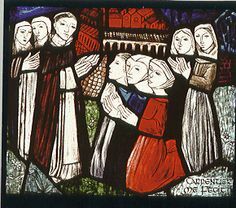 Women received into the first Dominican Monastery in 1207 by St. Dominic in Prouille, France. “From a stained glass window in a Dominican convent in Tokyo, Japan by Albert Carpentier, OP” (Tugwell 35). Legend holds that Dominic saw a vision of a globe of flame light the night sky over Prouille from his vantage point in the village of Fanjeaux where one such community of women was founded. In my own life as a minister at a Sinsinawa Dominican-sponsored institution, I cannot help but think of that fire of the Spirit that ignited Dominic’s zeal for prayer, study, community, and service also providing the spark for so many lay and religious women. The Sisters certainly are the inheritors of that flame of blessing that is so evident in their lives and relationships with students. They represent the way the Order has navigated differences from its very origins to my life today. [i] Simon Tugwell, OP. Saint Dominic and the Order of Preachers. Dublin, Ireland: Dominican Publications, 2001, 4. [ii] Tugwell, Saint Dominic, 45. [iii] Paul Murray, OP. The New Wine of Dominican Spirituality: A Drink Called Happiness. New York: Bloomsbury, 2006, 13.